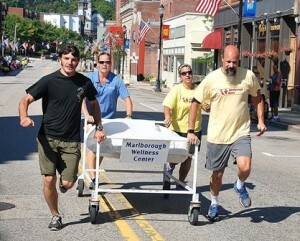 Marlborough – The Marlborough Lions Club continued a longtime tradition spanning over 30 years with its annual Bed Race held Sept. 1 prior to the Labor Day parade. This year, fifteen teams of four runners pushed a hospital bed east to City Hall where they applied linen. After continuing further east and making a U-turn, the teams raced back to City Hall and removed the linen. 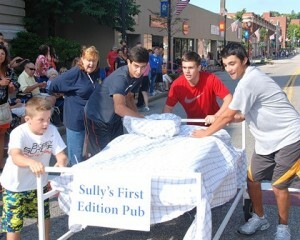 The winning team in 1:47 was sponsored by Sully’s First Edition Pub. 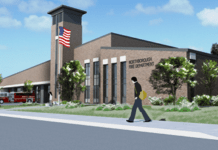 Proceeds help the club with its ongoing charitable causes including eyeglasses for those in need. Representing the Marlborough Wellness Center are (l to r) Jake and Julie Dalbec with Nicole and Todd DeCruz. 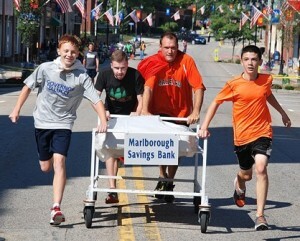 Finishing a close second place in 1:49 is the team sponsored by Marlborough Savings Bank consisting of representatives from the Marlborough High School cross country team: (l to r) Jeremy Bonds, sophomore; Sheldon Vigeant, coach; Jeff Downin, coach; and Owen Crisafulli, freshman. 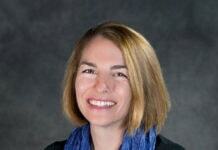 Next articleAdvice for potential homeowners: are you really ready to buy a home?